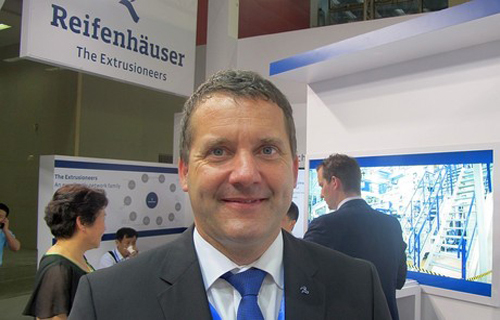 Eberhard Wenger, Director of Sales and Service, Reifenhäuser Plastic Machinery (Suzhou) Co. Ltd, also feels that the market this year is a bit slower than 2014. 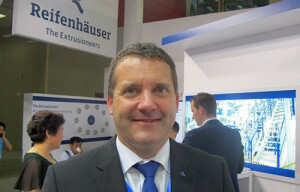 According to Mr Wenger, Reifenhäuser had a very good performance in China last year, with five cast film lines for service protection currently under installation. The change occurs as the living standard in China improved. For example, people are buying from supermarkets more often than local markets, increasing the demand for packaging films as a result. Growing diapers consumption is also driving the blown film market forward. For these kinds of high-end applications, Reifenhäuser has developed a new flattening unit – EVOLUTION ULTRA FLAT to improve the flatness of the film, thereby gaining better speed in printing and lamination. While in the past, flattening units were arranged just in front of the winder, EVOLUTION ULTRA FLAT is installed in the upstream, between the haul-off nip roll assembly and turner bar system. Flattening via stretching is significantly improved since the melt is still not fully crystallized at this point.